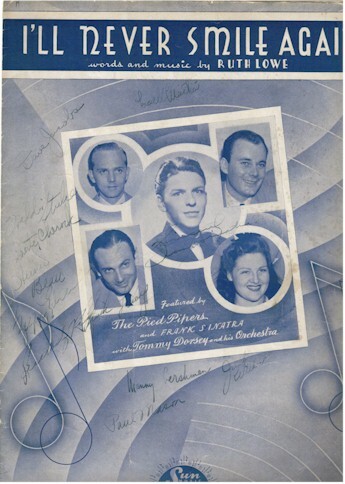 Original Vintage Sheet Music SIGNED by Frank Sinatra EARLY in his career in 1940. Provenance follows. The story for this item is this. The lady who we bought from said that in 1940 her mother went to a local dance hall called "rainbow gardens" here in Erie , PA. (it's still here). 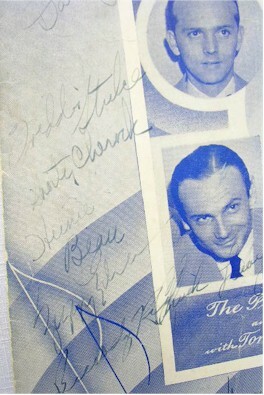 After the show Frank Sinatra and other members of the orchestra signed this sheet music. It is signed under his name in the middle: "sincerely Frank Sinatra". 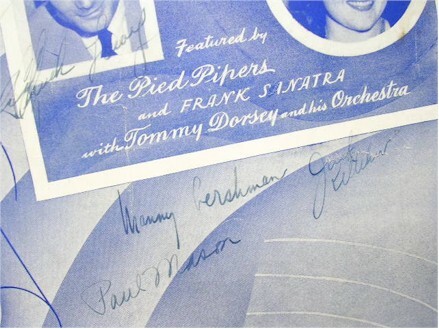 The sheet music also reads: featured by the pied pipers with frank Sinatra with Tommy Dorsey and his orchestra. I can't read all the autographs, but I’ll give it a try: Manny Gershman - Paul Mason - Dave Jacobs - Shorty Cherock - Freddie Stulce - Hunie Beau - Ziggy ?? - Lowell Martin. The 4 page sheet music is titled: I’ll never smile again - words and music by Ruth Lowe. Front page has some spots on the right hand side. There are also some small tears on the page edges. Covers show wear from sitting around. 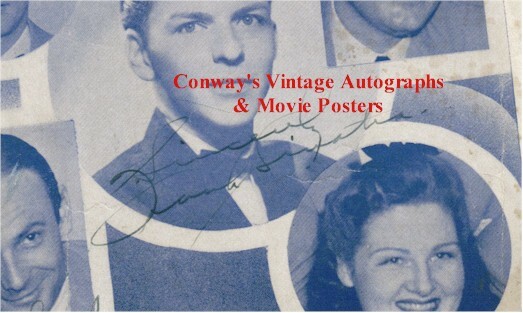 Another Exceptional AUTHENTIC Frank Sinatra SIGNED vintage treasure at a time when 99% of the Sinatra autographs on the market are fakes and forgeries.